The next generation Avocent AMX5010 is a 16x64 analog matrix switching solution that provides unmatched advancements in increased access and efficient scalability. The powerful Avocent AMX5010 solution increases the number of users with simultaneous access and provides access to all major server platforms and serial devices. Avocent's advanced AMWorks software is also included with the AMX5010 switch for central administration. The Avocent AMX5010-AM features the OSCAR on-screen management tool, which lets you conveniently switch between connected devices. If you require centralized administration of the Avocent AMX5010, AMWorks management software is included free with each switch. The AMWorks Java-based system administration tool supports customized user profiles and multi-level security. 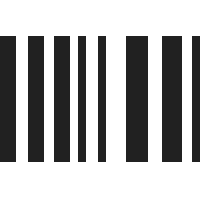 The AMWorks allows system administrators to build a user database with assigned access and password protection for each server. Administrators can view all activities that take place on the KVM system, including user login, switches made to servers and changes made to the system connections or setup. 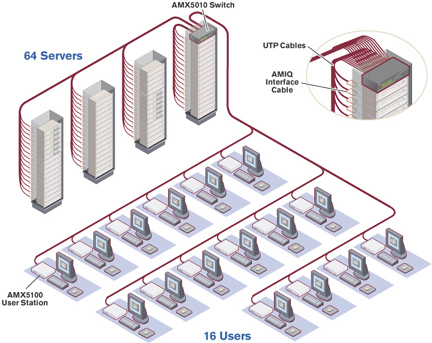 The database is centrally stored and can be downloaded to the switch via the network connection port available on all AMX5010-AM units. Question: Does the amx5010-am support CAC authentication? Answer: Thank you for your inquiry. Unfortunately, the AMX5010 doesn't support CAC authentication. Question: Will the AVRIQ or USBIAC interface modules work with the AMX5010? Answer: Thank you for your inquiry. The AMX uses the AMIQ series of interface modules, so unfortunately, we do not believe the AMX5010 will support AVRIQ or USBIAC interface modules. 32 port, 8 user Cat5 KVM. Manage your data center using Cat5 from 1000' away!